This amazing film has incredible number of distinction marks: 9 awards and 55 nominations (including 3 Oscars among last). Sometimes only from the film description you learn how, it turns out, many associations exist that make their own awards. Perhaps, so people wouldn’t wait Oscars awards for too long, only once in the year. We certainly are joking. Organizations are useful and important, and the more of them – the more people employed in show business. The plot is not medieval as it may seem at first glance – here is a mixture of different fairy tales and legends and everything is connected organically. Magic beans and Cinderella, the wicked stepmother and the witch, Rapunzel and …. But see all for yourself. 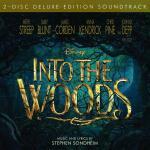 The soundtrack is impressive with its size – in addition to the 22 vocal melodies, listeners can enjoy also with 27 instrumental tracks. A total of 49 great songs! This is a huge work of music producers who not only adapted for the film from this classic stage musical all of them, but possible wrote from the scratch many new works. Johnny Depp in the role of the charming and just a bit scary wolf looks much more organic than in the positive role (as he was in the last film, commercially unsuccessful, Mortdecai). We imagine him to be that way – dark, scary, and from this he appears incredibly, blissfully, fascinatingly charming.